RALEIGH, NC– The application period is now open for the Susan G. Komen® North Carolina Triangle to the Coast (NCTC) Passing the Promise grant. The grant is awarded to non-profit community organizations in our 29-county service area, in eastern and central North Carolina, to help bring breast cancer survivors (survivors) and their caregivers (co-survivors) to the Komen Triangle Race for the Cure®, locally presented by Duke Cancer Institute, regardless of their ability to pay registration fees and travel expenses. The application deadline is Friday, May 1, 2015 at 5 p.m. Apply here. 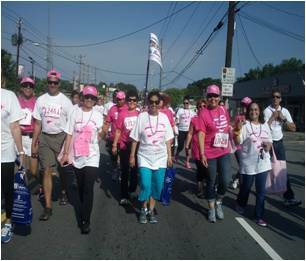 The Passing the Promise grant was developed in memory of Komen Triangle Race for the Cure® Founder Jeanne Peck and her vision of making the Race an event that embraces all survivors and co-survivors. The Komen Triangle Race for the Cure®, locally presented by Duke Cancer Institute, begins at 8:00 am Saturday, June 13 at Meredith College in Raleigh. Register today.